As of 8:00 am edt / 5:00 am pdt unofficial tropical depression 3E was centered at 14.3°N / 106.0°W or about 450 miles southwest of Acapulco. Movement is nearly stationary. Top sustatined winds are estimated at 35 mph with higher gusts. Very deep convection is near the ciculation center and it is possible that this system is a minimal tropical storm. Look for the hurricane center to upgrade on the 8 am pdt advisory. 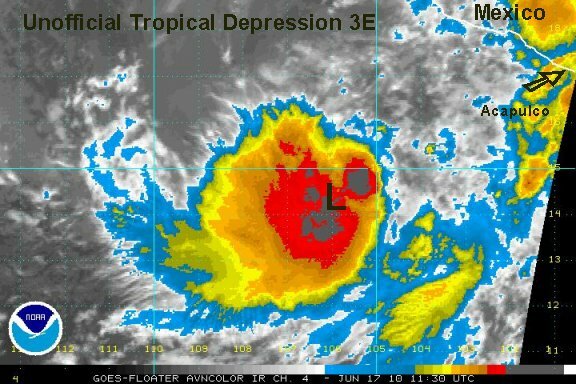 Unoffical tropical depression 3E is not a concern to land at this time. Higher than normal swell may be seen on the west coast. As expected, the hurricane center has upgraded the disturbance at 8 am pdt to tropical depression 3E with winds of 35 mph. Let's do this again. Satellite imagery indicates that the tropical cyclone has strengthened into a minimal tropical storm (unofficially). 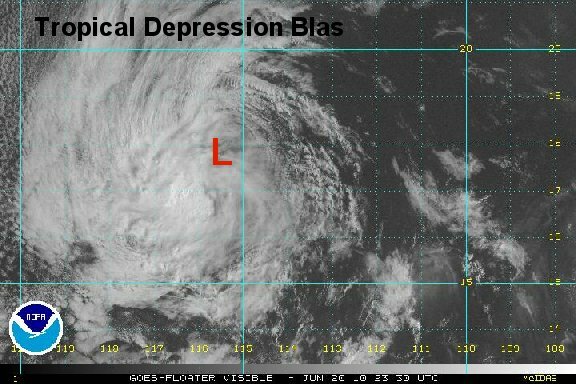 We expect the hurricane center to name this tropical depression - tropical storm Blas on the next official NHC update. As of 4:00 pm edt / 1:00 pm pdt unofficial tropical storm Blas was centered at 14.5°N / 106.4°W or about 470 miles west southwest of Acapulco. Movement is now to the west at about 8 mph. Top sustatined winds are estimated at 45 mph with higher gusts. 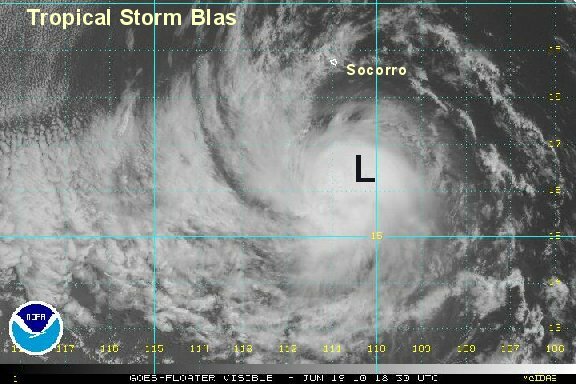 Unofficial tropical storm Blas continues to organize and outflow aloft looks favorable for additional strengthening. Forecast models are in agreement taking Blas away from land. The only concen to Cabo San Lucas or the western Mexican coast would be some higher than normal swell. As expected, the hurricane center just upgraded to tropical storm blas..... 45 mph. 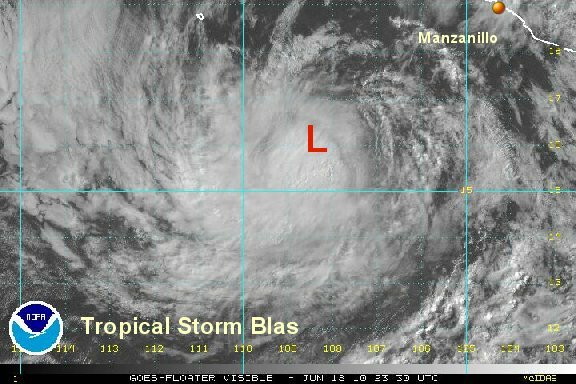 As of 9:00 pm edt / 6:00 pm pdt tropical storm Blas was centered at 15.5°N / 106.7°W or about 285 miles southwest of Manzanillo. Movement is now to the west at about 5 mph. Top sustatined winds are still estimated at 45 mph. 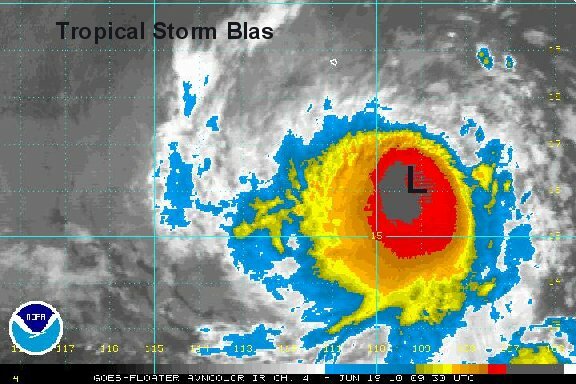 Tropical storm Blas is moving west or just north of west. After studying visible satellite imagery, we have relocated the surface low a little more northward. Overall, the appearance of Blas has not changed much from several hours ago. Outflow aloft is still being restricted with easterly winds. Blas will continue to move generally west, away from Mexico. 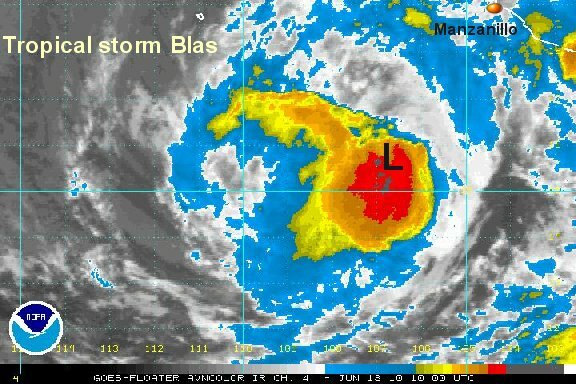 As of 6:00 am edt / 3:00 am pdt tropical storm Blas was centered at 15.8°N / 106.8°W or about 280 miles southwest Manzanillo. Movement is west northwest at about 5 mph. Top sustatined winds are still estimated at 45 mph. NHC estimated 40 mph shortly ago before the new burst started. Tropical storm Blas went through a weakening phase until recently. A new burst of convection has just started. Upper air easterly winds continue to shear Blas keeping the circulation center fairly close to the east side of the convection. Blas will likely continue to fight shear as it slowly progresses away from Mexico. Seas are in the 12-18 foot range near Blas and higher than normal swell will impact the west central coast of Mexico. The hurricane center updated to 45 mph on their last advisory to agree with our assesment. As of 8:00 pm edt / 5:00 pm pdt tropical storm Blas was centered at 16.2°N / 108.3°W or about 320 miles southwest Manzanillo. Movement is west northwest at about 7 mph. Top sustatined winds are still estimated at 45 mph (NHC 45 mph). Little change in structure today. Blas continues to fight easterly shear as it slowly progresses away from Mexico. Seas are in the 8-10 foot range near Blas and higher than normal swell will impact the west central coast of Mexico. 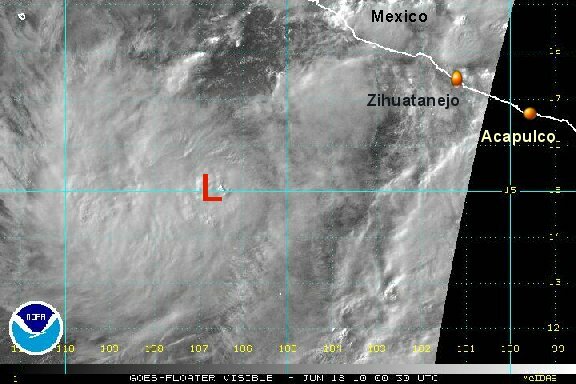 As of 6:00 am edt / 3:00 am pdt tropical storm Blas was centered at 16.4°N / 109.2°W or about 370 miles west southwest Manzanillo. Movement is west northwest at about 7 mph. Top sustatined winds are now estimated at 55 mph (NHC 50 mph). Satellite imagery shows the most impressive burst so far associated with Blas. This should correlate with winds of at least 55 mph. Easterly wind shear is keeping the deep convection to the west / southwest side of Blas. Seas are in the 8-11 foot range near Blas and higher than normal swell will impact the west central coast of Mexico. 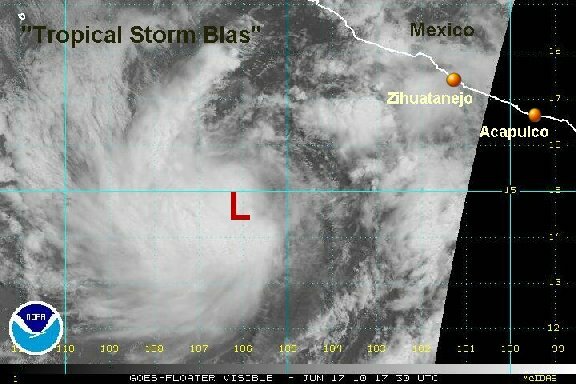 As of 3:00 pm edt / 12:00 pm pdt tropical storm Blas was centered at 16.3°N / 110.6°W or about 440 miles west southwest Manzanillo. Movement is west northwest at about 10 mph. Top sustatined winds are now estimated at 65 mph (NHC 65 mph). Satellite imagery indicates that the easterly shear has lessened. This has allowed for some strengthening. There also appears to be a tilt to the tropical storm. A mid level circulation looks to be south of the low level center. This is an indication of a system that is still organizing. Easterly wind shear is keeping the deep convection to the west / southwest side of Blas. Seas are in the 9-13 foot range near Blas and higher than normal swell will impact the west central coast of Mexico near Cabo Corrientes. 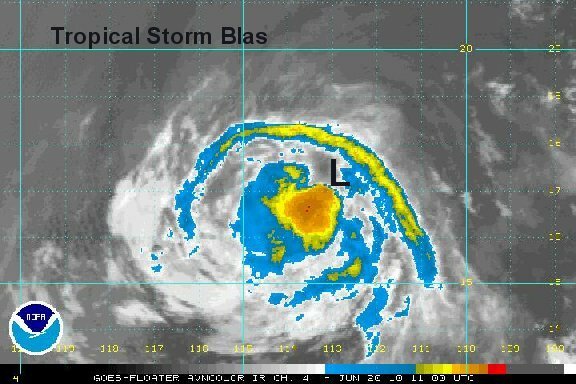 As of 7:00 am edt / 4:00 am pdt tropical storm Blas was centered at 17.5°N / 113.0°W or about 420 miles southwest Cabo San Lucas. Movement is nearly west at about 10 mph. Top sustatined winds are now estimated at 45 mph (NHC 45 mph). Satellite imagery from overnight shows that the convection associated with tropical storm Blas is quickly fading as it moves over cooler water. Blas will likely contine to weaken as it moves away from Mexico and dissipate over the next day or two. Seas are in the 12-19 foot range near Blas but will be dropping soon as the winds continue to drop. As of 8:00 pm edt / 5:00 pm pdt tropical storm Blas was centered at 17.7°N / 115.8°W or about 520 miles southwest Cabo San Lucas. Movement is nearly west at about 10 mph. Top sustatined winds are now estimated at 30 mph (NHC 35 mph). Blas has degenerated today with the surface low now just a broad center. Some deep convection with a mid level circulation is still intact to the south. Blas will continue to weaken. This will be the last update on Blas.